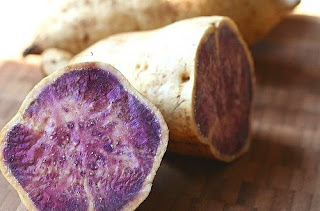 Has anyone seen the bright purple (on the inside) sweet potatoes in their local grocery stores?! I recently saw them at mine and couldn't wait to try them! Dr. Oz names this sweet potato in his 5 Superfoods to Eat Now. He reports that this sweet potato, or Imo is rich in beta-carotene and boasting 150% more antioxidants than blueberries! So what to do with it? I replaced regular sweet potatoes with these - the taste is very subtly different, and if anything, there is less taste in the purple sweet potato. I made my favorite dish - Sweet Potato Butter Bean Stew with these and it was still great!